(TIM WEIGHT/For the Gazette) The new American Philatelic Research Library, the world’s largest library devoted to the hobby of stamp collecting, celebrates its grand opening Friday, Oct. 28, and Saturday, Oct. 29. 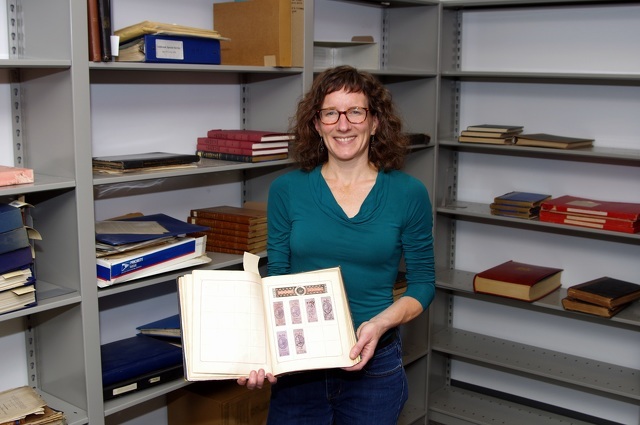 TIM WEIGHT/For the Gazette APRL director of information services/librarian Tara Murray holds an 1863 worldwide stamp album. 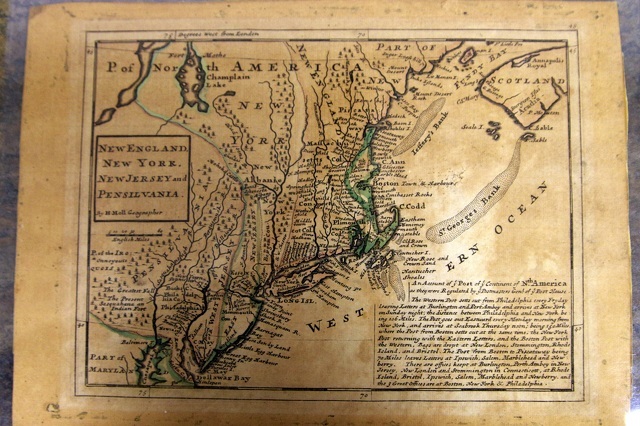 TIM WEIGHT/For the Gazette A 1729 postal map showing New England, New York, New Jersey and Pennsylvania is the oldest item in the library’s collection. TIM WEIGHT/For the Gazette The 19th-century Headsville Post Office at the American Philatelic Center is on loan from the Smithsonian. The working post office and general store operated in Headsville, W.Va., from the early 1860s until 1914. It was delivered from the Smithsonian to Bellefonte in pieces on refrigerated trucks. BELLEFONTE — It’s a celebration, Ken Martin says, more than a decade in the making. Hundreds of stamp enthusiasts from around the country and beyond will be in town this weekend for the grand opening ceremonies of the American Philatelic Research Library, the world’s largest library devoted to the hobby of stamp collecting. “You could say it’s been a 14-year odyssey,” said Martin, chief operating officer of the 30,000-member American Philatelic Society. The historic former match factory that houses the library was purchased in 2002, and renovations of the complex originally opened in 1900 have happened in phases. 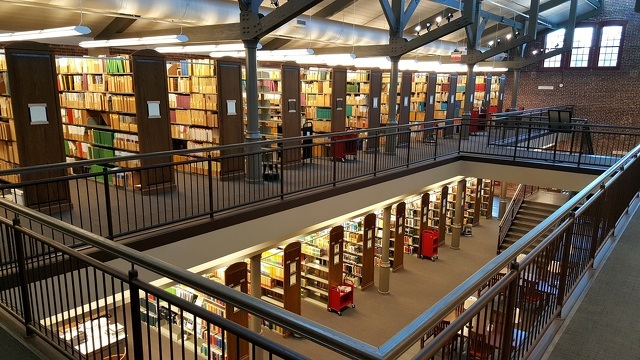 The $4 million, 19,000-square-foot library increases its floor space by about 60 percent at the American Philatelic Center, which it shares with the American Philatelic Society at 100 Match Factory Place, behind Tallyrand Park. The new library space actually opened in August, but the celebration is just beginning. The weekend’s festivities kick off with a dinner Friday night, Oct. 28, at the center. About 165 people from as far away as England are expected at the affair, which is sold out. The public is invited to the grand opening Saturday, Oct. 29. Martin said he expects that more than 300 people will attend. The library will be dedicated at a 10 a.m. ribbon-cutting. After the ceremony, the center will be open for visitors to tour until 4 p.m. There is much to see and do, even for the non-collector. Visitors can see displays and talk to staff members about postal history, as well as the history of the library, the society and stamp collecting. There is a display, for example, on Bellefonte’s role in the early history of air mail. The town was the first fueling stop on the route from New York to Chicago. From 1918 to 1927, pilots landed at an airfield at what is now Bellefonte Area High School. The pilots, Martin noted, were treated as celebrities in town, often staying with local families. Visitors Saturday can also purchase a collectible American Philatelic Research Library envelope with special cancellation. 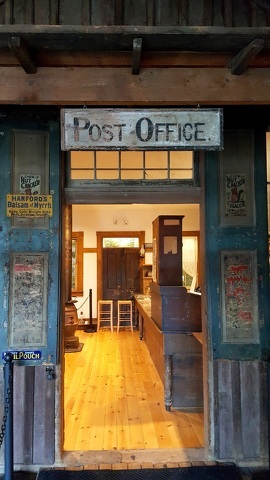 And they can buy current U.S. postage stamps at the 19th-century Headsville Post Office, on loan from the Smithsonian. The working post office and general store operated in Headsville, W.Va., from the early 1860s until 1914. It was delivered from the Smithsonian to Bellefonte in pieces on refrigerated trucks to preserve the wood and has been in use here since 2007. Saturday’s event will also feature a book fair, from 10:30 a.m. to 12:30 p.m., at which authors of five new philatelic books will be on hand to sign copies. The American Philatelic Research Library is the largest of about a dozen philatelic libraries in the United States. It houses more than 85,000 volumes and specialty materials. More than 99 percent of material at the library is donated; its acquisitions budget is less than $1,000 a year. ■ An 1863 worldwide stamp album. Among the stamps in the album on a page from Nova Scotia are revenue stamps from the Ventilating Waterproof Shoe Co. and from Estabrook & Wires Clinching Screw. Perhaps the library’s most celebrated items are two “Inverted Jenny” stamps worth about $250,000 each. They are not the most valuable stamps ever issued, Martin said, but they are perhaps the most famous. One of the two was just returned to the library in June after being missing for more than 60 years. The stamps are from a block of four stamps stolen at a 1955 American Philatelic Society show in Norfolk, Va.
Two of the four stolen stamps were located in 1979 and 1982 and returned to the library, which sold one and kept the other. The fourth stamp is still missing. The stamps were originally part of a sheet of 100 printed in 1918. According to the society’s website, Stamps.org, the Post Office Department created the stamps as it instituted airmail service. Since the stamps are bicolored — a blue plane inside a red frame on white paper — the stamps had be run through the press twice. The theory is that the inverted sheet was mistakenly placed on the press upside down during the printing of one of the colors on the sheet. The biplane depicted on the stamps is a Curtiss JN-4 “Jenny,” hence the “Inverted Jenny” moniker. The library’s first physical space was on Fraser Street in State College, from 1971-1982; it then moved to the corner of Oakwood Avenue and Waddle Road, before relocating to the old match factory complex in Bellefonte in 2004. Before its new space, the library was housed in two buildings at the complex. Stamp collecting has long been part of Martin’s life. He started collecting at age 11, and as a student at Penn State founded a stamp club on campus. He recalls that as a PSU freshman in 1982, he began riding his bike to volunteer at the APRL, which was then housed in a building behind what is now the Texas Roadhouse in State College. He’s been working for the society full-time since 1995. Director of information services/librarian Tara Murray, who manages the vast collection, took a different path to the library. Murray joined the APRL in July 2010 after spending nine years as an information services director for the Population Research Institute at Penn State. She was not a stamp collector, and said that while her skills were transferrable, she had to learn a new language. “I’ve picked up a lot in the last six years,” she said. The APRL processes more than 1,500 external requests for information a year. While most are from collectors, even fact checkers from game shows are among those with inquiries. The center sees its share of people who walk in wondering about the monetary value of their stamp collection, Martin said. For the most part, collectors would do well not to dream of big dollar signs. More than 700,000 stamps have been issued since 1840, and 98 percent are worth less than $1, according to Martin. For most, it’s about the fun and challenge of collecting. “We promote stamp collecting as a hobby,” he said.